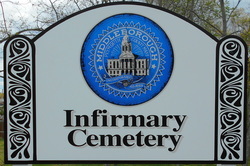 This is a town-owned cemetery on the west side of the railroad tracks beside the Ocean Spray facility. There is a break in the guard rails on Wood Street where parking is possible, but perhaps not advisable. Across the railroad tracks is the Alms House Cemetery. This cemetery was established in 1939. There are about 60 stones here. The stones have been labeled with metal numbers.